Tear one bunch of cleaned/dried organic curly kale into bite-sized pieces. 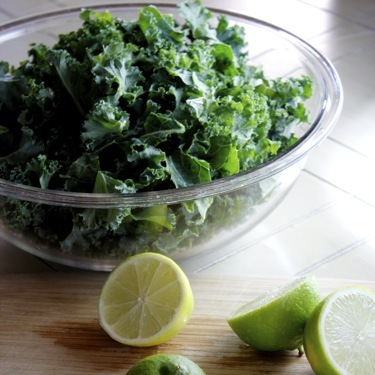 Place torn leaves in a large bowl and squeeze the juice of two limes over all the kale. Let kale “cook” in the lime juice for at least 30 minutes. 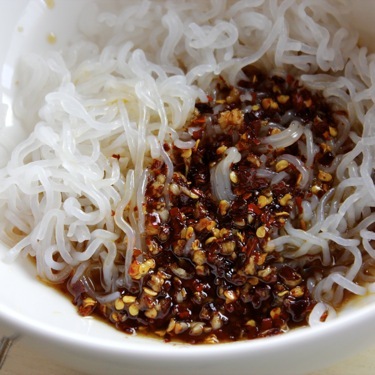 Rinse a package of shirataki noodles. Cook them in boiling water for 2 minutes. Rinse with cold water, drain well. Use a kitchen shears to cut the noodles up a bit. Add the dressing and toss. Add dried cherries and toss again. Spread noodle/cherry mixture on top of the kale. 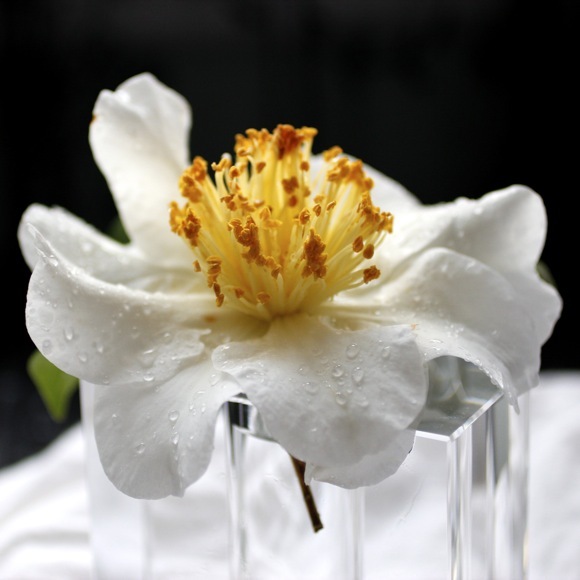 With its large wavy silvery white petals and fluffy yellow stamens, this is a stunning winter flower. Camellias are native to China, Japan, Korea and Taiwan. I read that red camellias are a symbol of wealth and white camellias signify loveliness. Last year, I planted red, white, as well as pink varieties to add more winter interest to my garden. My first Silver Waves bloom is such a beauty! Silver Waves was a seedling from an unspecified japonica variety and was introduced in 1970 by Nuccio’s Nursery of Altadena, California. Beautiful pictures and a great looking salad! Oh my this really looks appetizing, I love those ingredients. Sweet and spicy too, delicious. 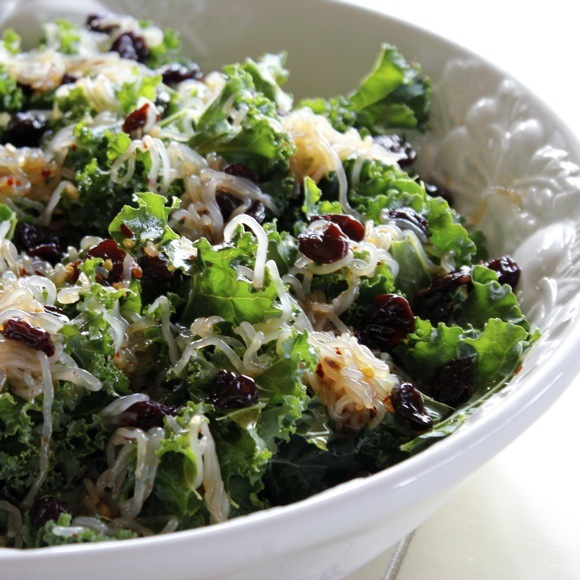 I am always reticent with raw kale – but do like it offset with a little sweet in the dressing. Allowing the kale to “cook” in the lime juice has great appeal! I love this! 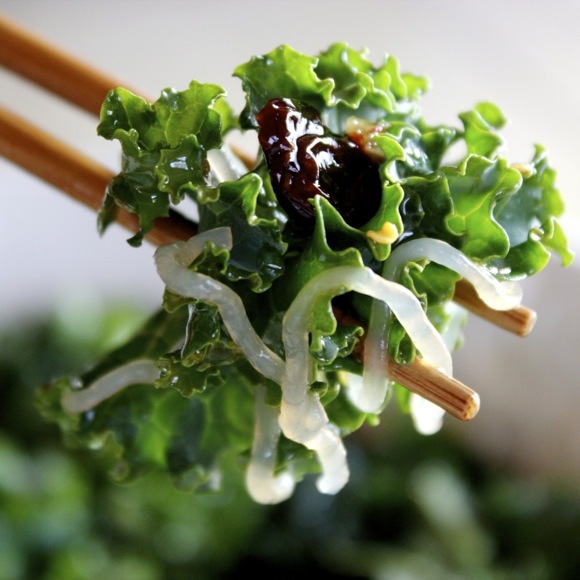 I am totally making this- love spicy, love kale and shirtaki! This is right up my alley. I am going to use my umami paste too! YAY! I’ve been making kale salads for about a half-a-year (usually mixed with some fruit, nuts, cheese and dressed with rice vinegar). I love the flavor profile here but I’m timid about trying shirtaki, which echoes my sentiments about trying tofu. Wow this is spectacular! Definitely want to try this immediately. What a pleasant and delicious salad! Sweet and spicy..that’s my flavours. Beautiful photos! And an interesting recipe. I must admit that I have never tried to prepare raw kale. I have access to baby kale, so I should definitely give it a try. And as I am writing, I got an idea: Thanks for the inspiration! What can I use as a substitute for the 1 T. Bragg Liquid Aminos. I get horrendous migraines from anything that contains a soy protein molecule. And Braggs is made from soybeans! do you think rice vinegar would work? Hi Victoria R – Worcestershire sauce might have similar umami flavors. So sorry for your migraines. This is a unique recipe with ingredients that are new to me. I am wondering where to get those noodles. It looks as if it is filled with flavor. Hi Casey – I bought them at Whole Foods. Thanks for your comment. Hi Sherry – Romaine would be a perfect substitute for kale here. Please let me know if you give it a try. I have been wanting to try kale. I will give this a try!